Beyond transparency, one of the reasons it is important for the dental laboratory to provide the dentist with patient contact materials contained in a dental restoration is to help troubleshoot challenges with a dental restoration should they arise. 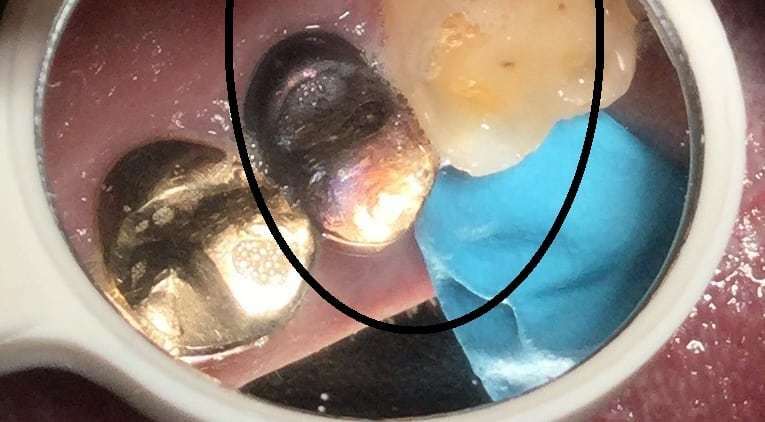 One such example of challenges that we can see with dental restorations, particularly those containing metallic materials, are galvanic reactions. What is a galvanic reaction? A galvanic reaction occurs when two dissimilar metallic materials are placed in contact. The contact results in the flow of electrical current. The amount of current (or intensity of the reaction) and the duration of the reaction are dependent upon the nature of the materials coming in contact. The greatest effect is seen when the materials are in direct contact, for example, two crowns in opposition to each other. However, saliva can act as a conducting medium allowing two dissimilar alloys to react even if there is no direct contact. Picture 1 shows a situation where a reduced gold crown was placed next to a high gold crown. The reduced gold crown tarnished after a few weeks. During the 1970’s there was a lot of research on galvanic reactions due to the ever increasing number of alloys available in the market place at that time. The usual result was a tarnish reaction or darkening of one of the alloys in vivo. We still see tarnish reactions today since patients switch dentists regularly and there is no record kept of what type of alloy was used for the previous restoration. The electrochemical series is normally a good predictor for the estimation of galvanic reactions. The metals are listed in the order of their chemical reactivity or electrode potentials, the most reactive at the bottom and the less reactive at the top (Table 1). The prediction is always that any given material will corrode any material below it in the series. It is a known fact that two dissimilar materials will generate some galvanic reaction. The question is if the reaction is of clinical significance. High Gold alloys coupled with Reduced Gold alloys. The reduced gold alloy will tarnish. The galvanic reaction is not clinically significant but the tarnish film is unsightly. In some countries patients have a card that keeps track of what type of restoration is on each tooth. This traceability saves time and money since knowing what type of material is present there is no possibility of choosing a wrong one. Any casting alloy coupled with silver amalgam. The worst case scenario is the introduction of a casting alloy restoration when amalgam is present. The amalgam restoration may have been stable for decades but the introduction of another conductive material will activate the amalgam resulting in the amalgam corroding. A galvanic cell is produced in vivo that may be strong enough to cause pain for the patient. This is especially true if an alloy restoration is placed in opposition to an amalgam. The amalgam corrosion may be seen as dark particles on the alloy restoration. A slight electric shock is also possible. However, if the saliva is conductive enough, a galvanic reaction can still occur if the amalgam is not in contact with the alloy restoration. Once this reaction is initiated replacing the amalgam is the only option to stop the reaction. Oftentimes, the lack of material transparency can cause challenges for dentists when trying to troubleshoot an issue with a patient. It may be helpful to ask your dental laboratory about the patient contact materials and material compositions contained in dental restorations and document the information in the patient records.